Teku glass. Bottle. Pitch black with light brown, tow fingers head. Average lacing. Roasted, smokey and wooden aroma. Taste is definetely roasted, form the middle you can feel heavy bitterness, which quickly dissapears, some tart and ashy notes. In the background some roasted coffee and zesty citrus. Dry, medium to full body, sticku to oily texture. Earthy aftertaste. In general interesting beer something between dry stout and black IPA. 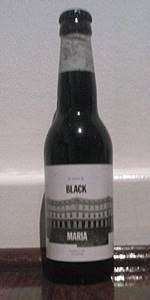 From the dry stout you can experiency ashy and dry notes, from black IPA some hoppy nature. Just try it. 330 ml bottle. Best before 2016-08-10. A: Opaque black. 3 fingers high of head with medium retention. S: Intense roasted aroma. Herbs, woods, and coffee. T: Highly roasted. Lemon. Some butter. Corn chips. High bitterness. Dry. Long and bitter finish. M: Full body. Moderate carbonation. Hmm, interesting. Definitely some roastiness going on. More of a brown ale taste than IPA. Would like a little more malt for an Imperial. P: Brown, almost black with a deep rich root beer float head. Small lacing. A: Toasted malt, boozy, smokey, molasses. M: Dry, medium body, very well rounded, great bitterness that lasts a long while. Tasted this at a beer club in Dublin - it was definitely a consensus favorite of the evening. The look is deep black and the smells of tobacco,coffee, maybe even oil. Taste is extremely deep and rich, with a bit of a bite on the end. Dry, definitely not sweet. I really enjoyed this beer. Pours deep dark brown with an overflowing light brown head. Beautiful! Strong earthy smell. Strong toasty taste, chocolate, rustic funk, and a bit of bitterness. Very flavorful! Totally black, with a light brown colored creamy foam. In the smell roasted malt, light toasted, and then a loto of american hops, with citrus and resnous notes. Full and round taste, malty. Light toasted, dark chocolate. Green notes of hop. And green nuts. Quite full body, without being too much. A lot of dark chocolate in the aftertaste, followed by green hops and cocoa. Long.